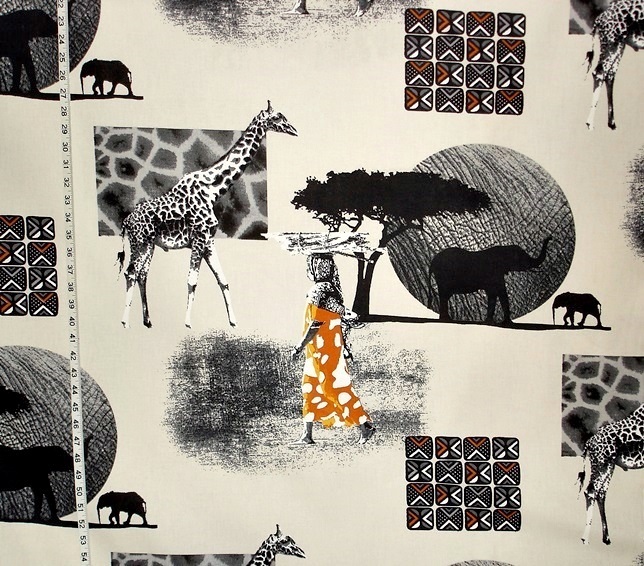 Our African animal fabric is back in stock! This was discontinued, but we found one bolt of it! 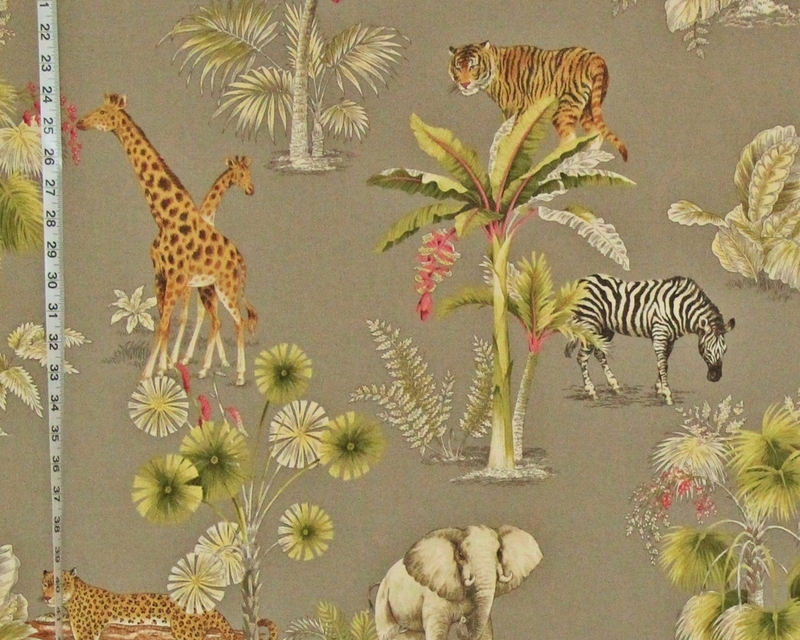 This fabric features exotic animals . There is a bull elephant, surveying his world; a zebra eyeing leafy branches; a leopard lying on a fallen tree; and a giraffe with a baby browsing on berries. A misplaced tiger from India smiles at all. This has a certain elegance to it. The background is a smooth wash of taupe, the animals are well defined, and the use of pink adds an unexpected bit of color. The ground cloth is a smooth twill with a soft hand, and nice drape. The total effect is really nice. One of the things that sets this apart from many of the exotic animal fabrics is the scale of the design and the spacing of the pattern. Many of exotic animal fabrics are crowded with jungle leaves and flowers. 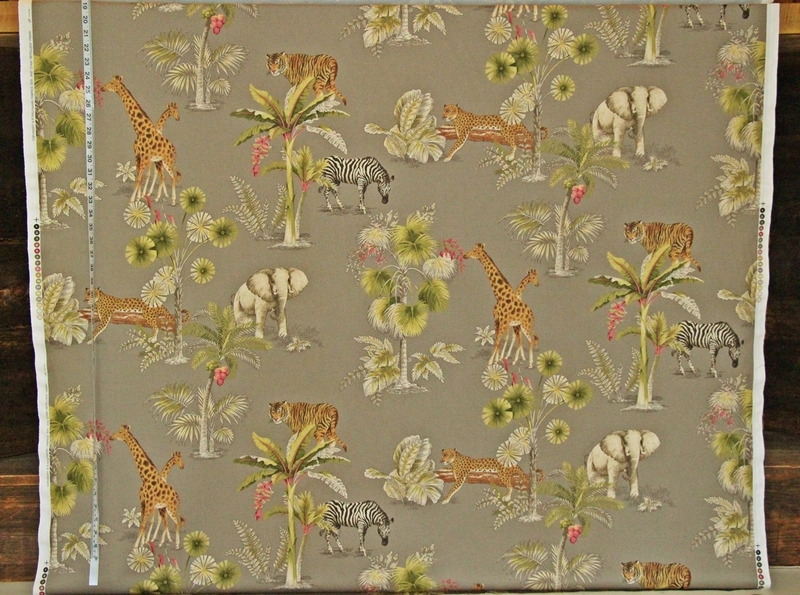 With this fabric one can enjoy the animals and all of the details. 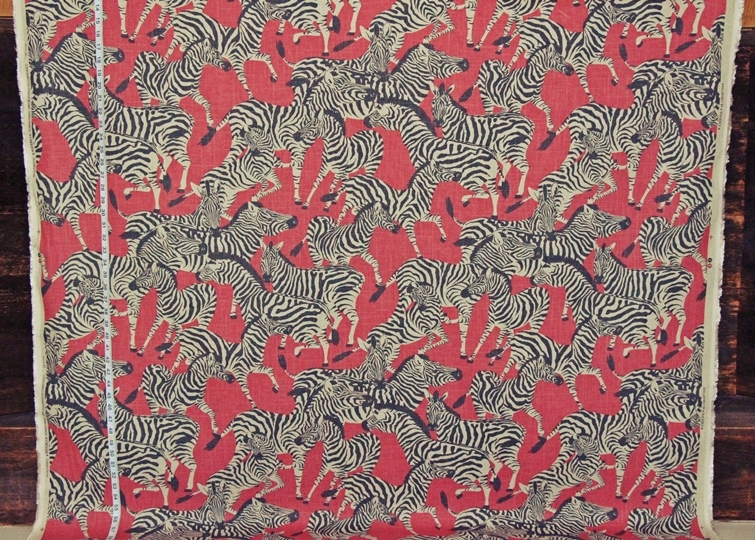 At the moment we don’t have many African animal fabrics in stock. 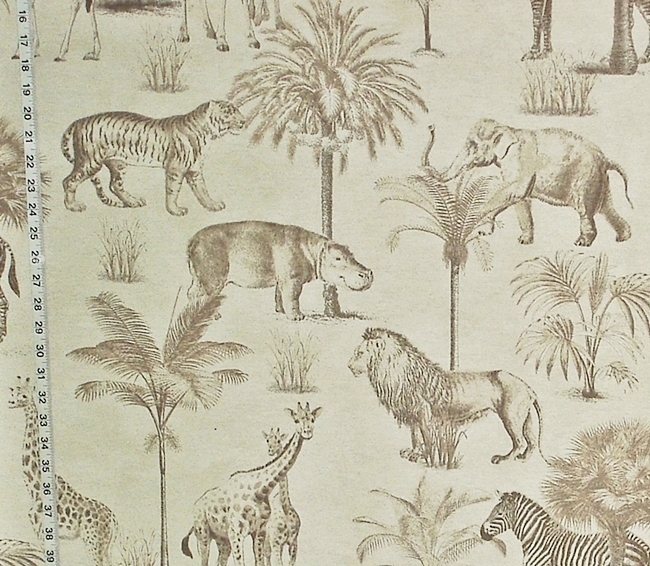 There is a small amount of the African animal charcoal toile fabric left. The zebra fabric has an intriguing design. Charcoal and beige zebras romp on a dusty raspberry background. 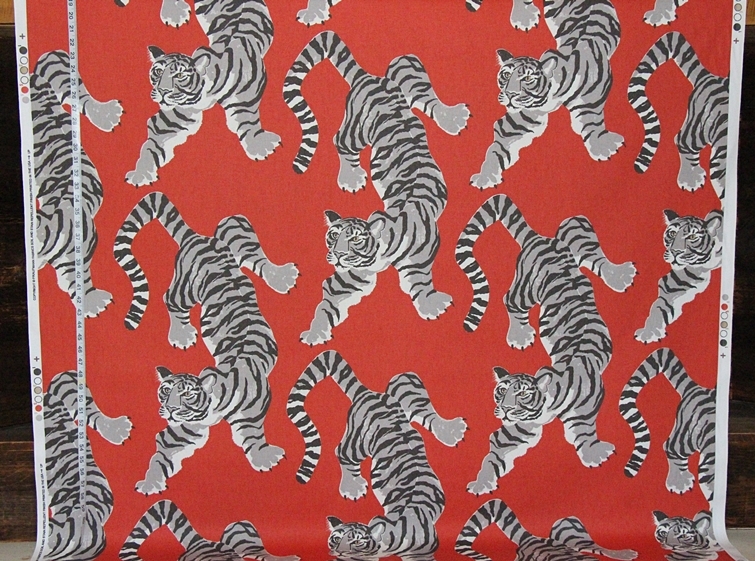 This bold tiger fabric makes a statement. It has the opposite effect of that of the zebra fabric. 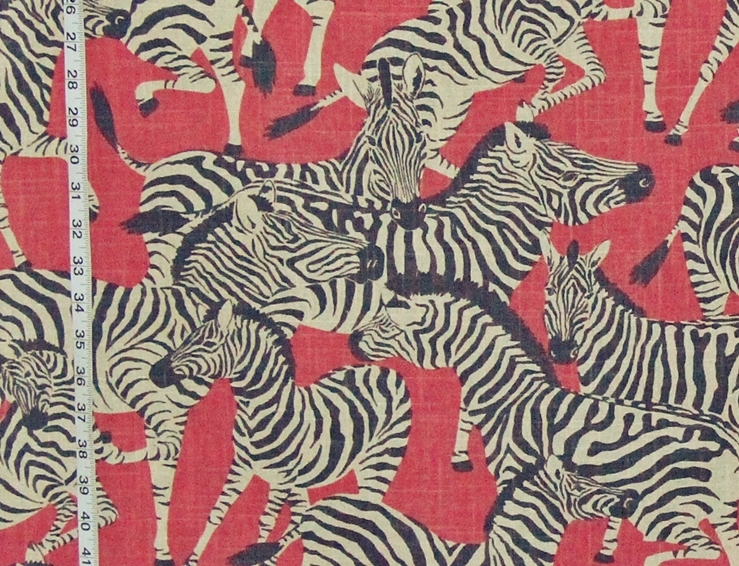 The zebra fabric has a tight pattern with animals going in all directions, which, along with the stripes, adds motion. The tiger fabric, has the same tiger in rows, with a lot of space between them. Their size and the way they are positioned give this a strong look and feel. Their size and the background orange make this a dramatic fabric. 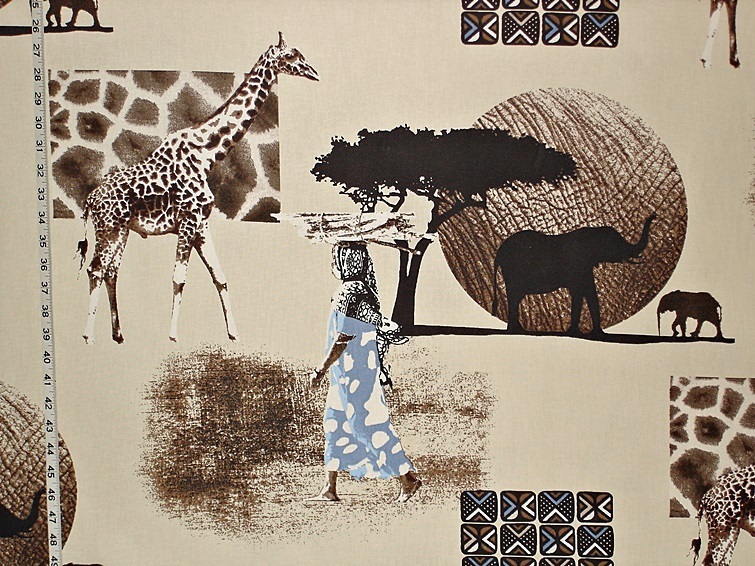 One of the most interesting fabrics with African animals is this African fabric. A woman walks through the African landscape. One Africa’s flat topped trees and elephants are silhouetted against a moon made of elephant skin. A giraffe is displayed against a swatch of it’s hide, and ethnic patterns add even more to the feel of this. This is a double wide fabric, and is also available in blue.